Hanoi (VNA) – The Ministry of Labour, Invalids and Social Affairs (MoLISA) has outlined programmes supporting livelihoods for labourers affected by a recent environmental incident in the four central provinces, particularly those in poor coastal districts. The MoLISA and the Ministry of Agriculture and Rural Development have estimated that around 230,000 labourers are being affected by the marine environmental incident, which was caused by Taiwan’s Formosa Ha Tinh steel company. The figure included 100,000 people who have been directly affected and 163,000 others who have been indirectly affected by the incident. In a recent interview granted to the media, MoLISA Deputy Minister Doan Mau Diep said a comprehensive scheme on vocational training, job creation and labour export is expected to be devised in the nearest future, following fact-finding trips to Thua Thien-Hue and Quang Tri provinces by MoLISA Minister Dao Ngoc Dung. The Minister planned to have working sessions with the other central provinces, Quang Binh and Ha Tinh, for the future introduction of the comprehensive scheme, which is expected to last until the marine environment comes back to normal, Diep said. The MoLISA will give priority to those living in affected coastal districts in the Employment Permit System programme it signed with the Korean Ministry of Employment and Labour in May 2016, which sets to recruit 3,500 Vietnamese workers as maximum. Other labour export programmes, like Japan’s IM programme, those involved coastal fishing with the Republic of Korea (RoK) and Taiwan, or a programme to train orderlies for Japan and Germany, will also prioritise labourers in the affected region, he noted. Under the Vietnam-Thailand labour cooperation agreement, Thailand will officially welcome Vietnamese working mainly in coastal fishing and construction starting from July 1. The Thai partners also committed to giving jobs to the Vietnamese without charging intermediary fees. The ministry will submit a proposal to the government to help poor residents in affected areas benefit from a project on assisting poor districts in boosting labour export, contributing to sustainable poverty reduction for 2009-2020. Regarding support for affected fishermen, the Ministry of Agriculture and Rural Development (MARD) suggested them switching from near-shore fishing to off-shore fishing, Diep said. 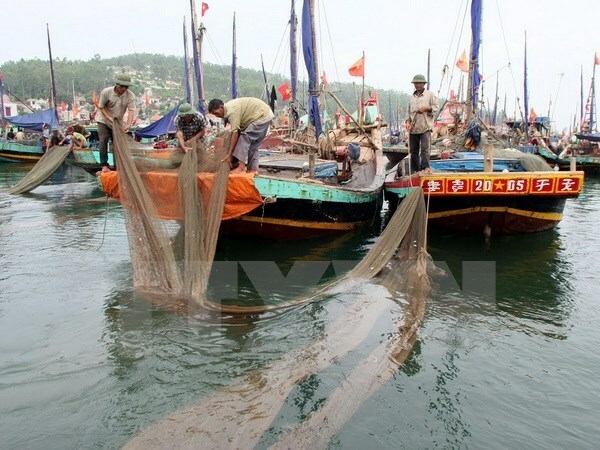 The MARD is working to submit a proposal to the government to provide soft loans and use the national fund for employment support for the fishermen. It is seeking to help the affected go fishing in other waters until Vietnam’s marine environment is safe, he said. For those who want to do other jobs, the MoLISA will coordinate with localities to offer training that meets demands of both labourers and the market. According to him, payment of health and social insurance will also be adjusted following the incident, with the support of State funding.